Selected natural monuments and places of interest I. On the eastern slope of Černá Hora (Black Mountain), at an altitude of 1,172 metres above sea level, one can find an artificially built spring into which was diverted water from a high bog, thus creating the symbolic beginning of the Vltava River (here it is yet called Černý Potok (Black Stream)). The border between the Black Sea and North Sea watersheds passes through the high bog. This is the most extensive peat bog valley in the Czech Republic, a protected area (1st zone of a National Park). 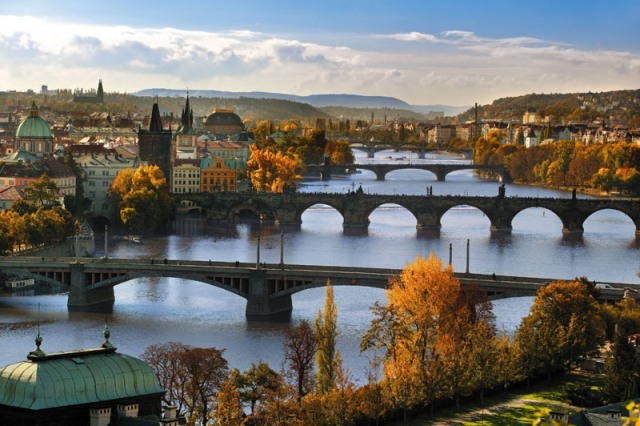 After the small town of Lenora, the Teplá Vltava (Warm Vltava) flows through a wide and flat valley, where the river gradient is very small, thus creating a characteristic meandering river with numerous cut-off branches and pools. Many rare species of flora and fauna can be found here, such as the rare carnivorous round-leaved sundew. This is a nature reserve (part of the 1st zone of the Šumava National Park) having an area of 394 ha located south of the village of Volary at the confluence of the Teplá (Warm) and Studená (Cold) Vltava Rivers. It has an extensive peat bog, the predominant growth being the bog pine. Some of the pines have been estimated to be up to 300 years old. Also characteristic for this area are lone-standing dry “dead” trees, damaged by fire in the past. A national nature reserve. An extensive area of detritus (a sea of stones) can be found in the section between Loučovice and Vyšší Brod, above the deep canyon carved by the Vltava, which covers an entire hillside all the way down to the river. On the summit there are mighty rock formations. The best-known, the so-called Devil’s Pulpit, is accessible from the Vyšší Brod – Loučovice road. The Schwarzenberg princely court, built in 1699 on the location of two large filled-in ponds. Currently, located in a reconstructed building is the modern Nová Obora Glass Works, freely accessible to all those interested in the glass-making trade. A protected area near the village of Zbonín (the district of Písek) in which can be found the remains of a so-called relict pine forest, which is estimated to be more than 170 years old. The common hornbeam and the Scots pine are the dominant trees. The Sedláčkova nature trail leads through the area. Along it, it is possible to go from the town of Písek all the way to the town of Orlík nad Vltavou. Near the village of Nalžovice (district of Příbram), on the right bank of the Vltava, one can find groups of cliffs and areas of broken stones and thick detritus forests with profuse growth of the endangered summergold yew. The area is also the nesting ground for many birds of prey. A nature trail with many lookouts leads along its entire length. A nature trail built in 1999 in the nature reserve of the same name. The area, which has an area of approximately 67 ha, was declared a reserve in 1989 and spreads out on the south side of the Slapy Dam above the village of Mokrsko. Practically on the opposite bank one can find a similar reserve, Drbákov – Albertov Cliffs. A nature reserve, declared in 1989, with an area of more than 53 ha, spreads out on the steep slopes of Kletecko Peak on the right bank above the Štěchovice Dam. Many warm-loving species of plants grow in the reserve. The so-called Smetana’s lookout is located on Kletecko Peak. This is a nature reserve near the southern edge of Prague that has steep slopes leading down to the Vltava and also adjacent forests and meadows. The nature trail with information boards connects the Zvolská homole Nature Reserve with the villages of Vrané nad Vltavou and Zvole. Natural Monuments I. Natural Monuments II. Natural Monuments III.